" Zen is a journey of awakening the mind. For like a slumbering child immersed in dreams, people often go through life without pausing once to reflect on their significance, their relation to the universe, much less their being. Consequently, theirs are lives lived in the shadows, merely skimming through the surface of life, not truly living but merely existing. 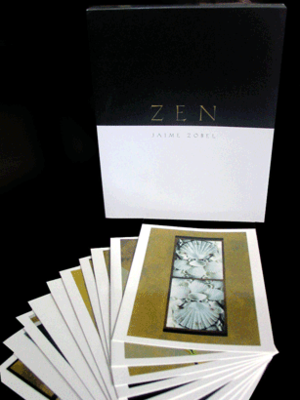 Finding inspiration in the ageless wisdom of Zen Buddhism, renowned photographer Jaime Zobel has put together a collection of works that marries art and spirituality. With Zen, Zobel presents spare but powerful compositions. Leaves, stones, shells and flowers lie at the heart of each, inviting contemplation. At times, these take on the aspect of other objects, such as full moon-- a deeply significant Zen image symbolizing a person's enlightened true nature. These compositions, too, are reminiscent of the Zen art form called enso. Enso is a simple brush stroke. Traditionally executed by a monk using a sumi bursh, what makes this special is that is drawn at the exact moment of his enlightenment. Enso renditions thus vary, perfectly reflecting the state of min of the person who made it. As a Zen symbol, it represents emptiness with fullness, beginning and ending, perfection of one's being, and enlightened mind. Thus, with these compositions, one is encouraged to take a keener glance, and pause for a deeper reflection. With Zen, one is invited to awaken to life. "